PediBal is based in Chester le Street, County Durham. The company has developed and patented the first 3-in-1 bike that converts from a balance bike through to a seated scooter (Sceeta) and then a fully functioning pedal bike. Children can learn the most essential element of balance riding on two wheels, and progress to full pedal riding with one familiar super lightweight aluminium bike. Built with a low centre of gravity the design allows balance to be achieved at a tiny 2 mph speed. Two different models cover children’s ages from 18 months to 5 years with the Scampa model, and 4 years to 12 years with the Sprinta version. As the riders gains balance the scooter assembly can be fitted with three bolts. The foot-rests can be operated independently allowing the rider to use the bike as a seated scooter. The bike can then be fitted with the supplied full pedal crank and chain guard. All of this can be achieved with just one purchase. 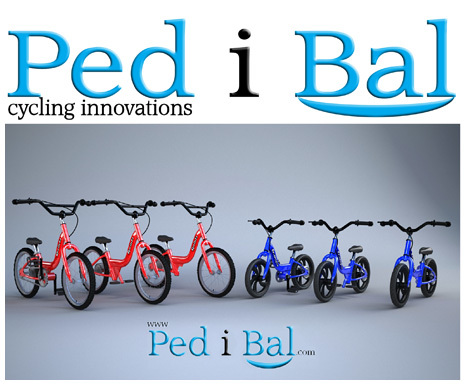 The Pedibal range is equally successful for children with balance and co-ordination challenges, as well as those with Dyspraxia, Aspergers Syndrome, Autism or Downs Syndrome. PediBal is a County Durham toy shop that specialises in bikes & rides. This Chester-le-Street-based shop is less than 1 mile from PediBal. This Newcastle-based shop is 8 miles from PediBal. This South Shields-based shop is 11 miles from PediBal.